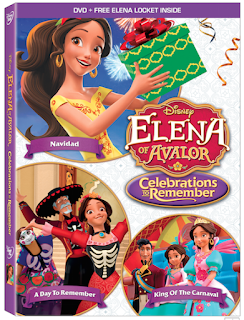 Just in time for the holidays, Elena is back with all-new adventures coming to DVD with the release of Elena of Avalor: Celebrations to Remember! Join Elena and her friends and family as they celebrate holidays that honor the past, cherish the present and look forward towards a magical future! In these new adventures Avalor celebrates Navidad, Dia de los Muertos and Carnaval! There’s something special to look forward to with each holiday! Voice Cast: Aimee Carrero (Freeform's “Young & Hungry”) as Princess Elena; Jenna Ortega (Disney Channel's “Stuck in the Middle”) as Princess Isabel; Chris Parnell (“Sofia the First”) as Migs; Yvette Nicole Brown (“Community”) as Luna; Carlos Alazraqui (Disney Pixar's “Inside Out”) as Skylar; Emiliano Díez ( “George Lopez”) as Francisco; Julia Vera (ABC's “General Hospital”) as Luisa; Christian Lanz (“Teenage Mutant Ninja Turtles”) as Chancellor Esteban; Jillian Rose Reed (“Awkward”) as Naomi; Joseph Haro (“Awkward”) as Mateo; Jorge Diaz (“The 33”) as Gabe; Keith Ferguson (Disney Pixar's “Inside Out”) as Zuzo; Joe Nunez (“Jake and the Never Land Pirates”) as Armando and Jane Fonda (“Grace and Frankie”) as Shuriki.